Sam throws a rock off the edge of a tall building at an angle of from the horizontal. The rock has an initial speed of . How long is the rock in the air? We first need to find the vertical component of the velocity. We can plug in the given values for the angle and the initial velocity to find the vertical component. Now we need to solve for the time that the rock travels upward. We can then add the upward travel time to the downward travel time to find the total time in the air. Remember that the vertical velocity at the highest point of a parabola is zero. We can use that to find the time for the rock to travel upward. Now let's find the time for the downward travel. We don't know the final velocity for the rock, but we CAN use the information we have been given to find the height it travels upward. Remember, only tells us the vertical CHANGE. Since the rock started at the top of a building, if it rose an extra , then at its highest point it is above the ground. This means that our will be as it will be traveling down from the highest point. Using this distance, we can find the downward travel time. Add together the time for upward travel and downward travel to find the total flight time. What is the horizontal distance that the rock travels? We first need to find the horizontal component of the initial velocity. We can plug in the given values for the angle and initial velocity and solve. The only force acting on the rock during flight is gravity; there are no forces in the horizontal direction, meaning that the horizontal velocity will remain constant. We can set up a simple equation to find the relationship between distance traveled and the velocity. We know , but now we need to find the time the rock is in the air. We need to solve for the time that the rock travels upward. We can then add the upward travel time to the downward travel time to find the total time in the air. Now that we've finally found our time, we can plug that back into the equation from the beginning of the problem, along with our horizontal velocity, to solve for the final distance. At what angle to the horizontal will the rock impact the ground? The question gives the total initial velocity, but we will need to find the horizontal and vertical components. To find the horizontal velocity we use the equation . We can plug in the given values for the angle and initial velocity to solve. We can find the vertical velocity using the equation . The horizontal velocity will not change during flight because there are no forces in the horizontal direction. The vertical velocity, however, will be affected. We need to solve for the final vertical velocity, then combine the vertical and horizontal vectors to find the total final velocity. We know that the rock is going to travel a net distance of , as that is the distance between where the rock's initial and final positions. We now know the displacement, initial velocity, and acceleration, which will allow us to solve for the final velocity. Because the rock is traveling downward, our velocity will be negative: . Now that we know our final velocities in both the horizontal and vertical directions, we can find the angle created between the two trajectories. The horizontal and vertical velocities can be compared using trigonometry. 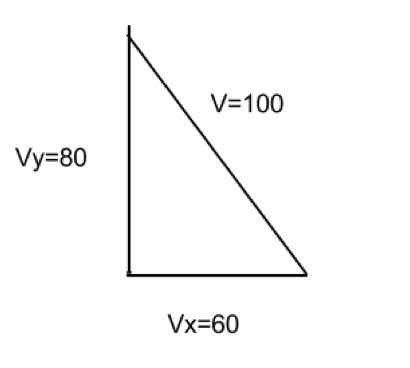 Plug in our values and solve for the angle. If air resistance is negligible, 8 seconds after it is released, what would be the velocity of a stone dropped from a helicopter that has a horizontal velocity of 60 meters per second? We are looking for total velocity, which in this case has both a horizontal and vertical component. University of Minnesota-Twin Cities, Bachelor of Science, Computer Science.